The purpose of this article is to summarize the diverse aspects of scientific discussion revolving around the notion itself and complicated questions of the modern theory of modernization. One of the main point of discussion is the new relationship between once so dissimilar conceptions like modernization, democratization and globalization. These conceptions have been brought together in the end of the XXth century and since that time usually discussed interconnected, often maintaining a heterogeneous sense. The terms “modernization” and “globalization” have come to be emotionally charged in public discourse. For some, they imply the promise of an international civil society, conducive to a new era of peace and democratization. For others, they imply the threat of an American economic and political hegemony, with its cultural consequence being a homogenized world. Nevertheless, some distinct characteristics defining the general tendencies of the modernization process really exist. The main tendency is the changing meaning of modernity, or the emergence of “alternative modernities”. There is also the increasingly significant phenomenon of alternative globalizations that is, cultural movements with a global outreach originating outside the Western world and indeed impacting on the latter. The second trend is related to a crisis in the legitimacy of the nation-state tradition forcing to review the problem of the role of democracy in the modern world. S.M. Lipset's observation that democracy is related to economic development, first advanced in 1959, has generated the largest body of research on any topic in political science. Yet there are two distinct reasons this relation may hold: either democracies may be more likely to emerge as countries develop economically (S.P. Huntington, R. Inglehart), or they may be established independently of economic development but may be more likely to survive in developed countries. The basic assumption of the theory of modernization, in any of its versions, is that there is one general process of which democratization is but the final stage. Modernization consists of a gradual differentiation and specialization of social structures that culminates in a separation of political structures from other structures and makes democracy possible. But now a prevailing view, according to which the emergence of democracy is not a by-product of economic development (G. O’ Donnell). The protagonists of this approach do not believe that the fate of democratic rule would be determined exclusively by current levels of economic development. They maintained that, albeit within constraints, democratization was an outcome of actions, not just of economic conditions as like as historical past (A. Giddens, R.M. Unger). modernization, development, state, economic growth, democracy, political processes, globalization, political theory, public discourse. Aron R. Demokratiya i totalitarizm. Moscow: Tekst; 1993. 303 p. (In Russ.). Vallerstajn I. Mir-sistema Moderna. Tom I. Kapitalisticheskoe sel'skoe hozyajstvo i istoki evropejskogo mira-ehkonomiki v XVI veke. Predisl. G.M. Derlug'yana, per. s angl., liter. redakt., komm. N. Procenko, A. CHernyaeva. Moscow: Russkij fond sodejstviya obrazovaniyu i nauke; 2015. 552 p. (In Russ.). Vallerstajn I. Mir-sistema Moderna. Tom II. Merkantilizm i konsolidaciya evropejskogo miraehkonomiki, 1600—1750 gg. Per. s angl., liter. redakt., komm. N. Procenko. Moscow: Russkij fond sodejstviya obrazovaniyu i nauke; 2015. 528 p. (In Russ.). Vinogradov A.V. Kitajskaya model' modernizacii. Poiski novoj identichnosti. Izdanie vtoroe, ispravlennoe i dopolnennoe. Moscow: NOFMO; 2008. 363 p. (In Russ.). Marks K. Kapital. Kritika politicheskoj ehkonomii. T. 1. Marks K., EHngel's F. Soch., 2-e izd. Moscow: Gosudarstvennoe izdatel'stvo politicheskoj literatury; 1955—1981. 907 p. (In Russ.). Merkel' V. Teoriya transformacii. Struktura ili aktor, sistema ili dejstvie? Povoroty istorii. Postsocialisticheskie transformacii glazami nemeckih issledovatelej. Tom 1. Postsocialisticheskie transformacii: teoreticheskie podhody. Red.-sost. Petra SHtykov, Simona SHvanic. SPb. : Evropejskij universitet v Sankt-Peterburge: Letnij sad; 2003: 55—88. (In Russ.). Oganis'yan YU.S. Novaya Rossiya v izmenyayushchemsya mire: social'no-politicheskij rakurs. Polis. Politicheskie issledovaniya. 2014; 3: 76—90. (In Russ.). Simoniya N.A. Novye strategicheskie faktory v bor'be za modernizaciyu Rossii. Polis. Politicheskie issledovaniya. 2014; 3: 67—75. (In Russ.). Hantington S. Stolknovenie civilizacij? Polis. Politicheskie issledovaniya. 1994; 1: 33—48. (In Russ.). Hantington S. Tret'ya volna. Demokratizaciya v konce HKH veka. Moscow: “Rossijskaya politicheskaya ehnciklopediya” (ROSSPEHN); 2003. 368 p. (In Russ.). Hyoffe O. Est' li budushchee u demokratii? O sovremennoj politike. Moscow: Izdatel'skij dom «Delo» RANHiGS; 2015. 328 p. (In Russ.). Beck U. Living Your Own Life in a Runaway World: Individualization, Globalization and Politics. Global Capitalism. Ed. by Will Hutton and Antony Giddens. New York: The New York Press; 2000: 163—173. Beck U. What is Globalization? Cambridge: Polity Press; 1991. 192 p.
Berger P.L. The Cultural Dynamics of Globalization. Many Globalizations. Cultural Diversity in the Contemporary World. Ed. By Peter L. Berger and Samuel P. Huntington. Oxford; New York: Oxford University Press; 2002: 1—16. Birch A.H. The Concepts and Theories of Modern Democracy. 3rd Edition. London and New York: Routledge; 2007. 315 p.
Dahlen A.P. Islamic Law, Epistemology and Modernity. Legal Philosophy in Contemporary Iran. New York & London: Routledge; 2003. 392 p.
Eisenstadt S.N. Modernization: Protest and Change. Englewood Cliffs, N.J.: Prentice-Hall; 1966. 166 p.
El-Ojeili Ch., Hayden P. Critical Theories of Globalization. New York: Palgrave Macmillan; 2006. 241 p.
Giddens A. Beyond Left and Right: The Future of Radical Politics. Stanford: Stanford University Press; 1994. 284 p.
Giddens A. The Consequences of Modernity. Cambridge: Polity Press; 1991. 200 p.
Giddens A. The Third Way and Its Critics. Cambridge: Polity Press; 2000. 190 p.
Giddens A., Hutton W. Fighting Back. Global Capitalism. Ed. by Will Hutton and Antony Giddens. New York: The New York Press; 2000: 213—224. Gill G. Democracy and Post-Communism. Political Change in the Post-Communist World. London and New York: Routledge; 2002. 272 p.
Höffe O. Democracy in the Age of Globalization. Dordrecht: Springer; 2007. 350 p.
Inglehart R. Modernization and Postmodernization: Cultural, Economic, and Political Change in 43 Societies. Princeton, N.J.: Princeton University Press; 1997. 464 p.
Inglehart R., Welzel Chr. Modernization, Cultural Change, and Democracy. The Human Development Sequence. Cambridge: Cambridge University Press; 2005. 333 p.
Lipset S.M. Political Man. The Social Basis of Politics. Expanded Edition. Baltimore: Johns Hopkins University Press. ; 1981. 586 p.
Many Globalizations. Diversity in the Contemporary World. Ed. by Peter L. Berger and Samuel P. Huntington. Oxford; New York: Oxford University Press; 2002. 374 p.
McDaniel T. Autocracy, Modernization and Revolution in Russia and Iran. Princeton, New Jersey: Princeton University Press; 1991. 239 p.
Moeller J. Post-Communist Regime Change. London and New York: Routledge; 2009. 177 p.
O’Donnell G. Poverty and Inequality in Latin America: Some Reflections. Latin America: Issues and New Challenges. Edited by Victor E. Tokman and Guillermo O'Donnell Chicago: University of Chicago Press; 1999: 49—71. Rostow W.W. The Stages of Economic Growth: A Non-Communist Manifesto. Cambridge: Cambridge University Press; 1960. 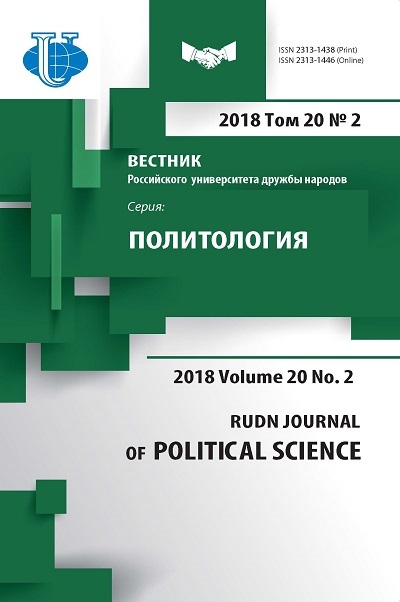 179 p.
Sakwa R. Russian Politics and Society. Fourth Edition. London and New York: Routledge; 2008. 585 p.
The Oxford Handbook of Comparative Politics. Ed. by Carles Boix and Susan C. Stokes. Oxford: Oxford University Press; 2007. 1021 p.
Understanding Contemporary Society: Theories of the Present. Ed. by Gary Browning, Abigail Halcli and Frank Webster. London: Sage Publications; 2000. 502 p.
Unger R.M. What Should the Left Propose? London; New York: Verso; 2005. 179 p.
Copyright (c) 2018 Gutorov V.A.